HOME ADDRESS: Village- Jaurumal, Rajgangpur, Sundargarh, Odisha, India. FAMILY: Father (Thobo Toppo), Mother (Chakravarty Toppo). PRODUCT OF: Sports Hostel, Panposh, Rourkela (Joined in 2006). * Participated in the Junior Nehru Cup Tournament in 2007, 2008, 2009 (Champions), 2010 (3rd position). * Represented Orissa in the National Rural Games in 2009 (Champion). * Represented Orissa in the National Inter-School Games in 2008 (3rd) and 2011 (Champion). * Represented Orissa in the Sub-junior National Championships in 2008 (3rd position). 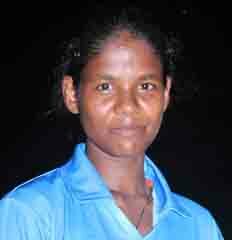 * Represented Orissa in the Women’s National Games in 2010 (Runners up). * She was part of the Indian team that won gold medal in Women’s Hockey Asia Cup after a gap of 13 years at Kakamigahara city in Japan on Nov 5, 2017. * Represented the country in the FIH Champions Challenge 1 in Glasgow in 2014. * Represented the country in the 8th Women’s Asia Cup in Malaysia in 2013. * Represented the country in the 3rd Women’s Asian Champions Trophy in Japan in 2013. * Reached the milestone of 150 international caps in their Women World Cup opening match against England in London on July 21, 2018. * Played her 100th international match against Australia at the Rio Olympics on August 10, 2016. * She was felicitated with the Asunta Lakra Award for Upcoming Player of the Year 2014 (Women Under-21) and a purse of Rs 10 lakh by Hockey India in its annual award function at New Delhi on March 28, 2015. * Odisha government on October 10, 2014 announced a cash award of Rs 75,000 lakh for Namita for helping India win women`s bronze medal in the 17th Asian Games at Incheon. * Odisha Cricket Association on Oct 2, 2014 announced a cash award of Rs 10,000 for Namita for helping India win the bronze medal in the 17th Asian Games at Incheon. * Played her 50th international match against South Africa at the 20th Commonwealth Games 2014 in Glasgow, Scotland on July 30, 2014. She achieved the feat in a period of 2 years. * Made her international debut during the FIH Champions Challenge 1 in Dublin in 2012.